The holiday season is approaching and our office is abuzz with discussions of Thanksgiving menu planning and recipe swapping. While we adults take care of the labor-intensive turkey roasting and potato mashing, we also love to get our kids in on the fun! Cooking and making snacks together is a great way to engage your children in festivities of the season while teaching them some valuable lessons about health and nutrition. Don’t get us wrong — we look forward to treating our kids to pumpkin pies and apple crisps just a much as the next family! But, nothing really beats the laughter and creativity that come to life when they’re creating their own yummy and healthy snacks to support their developing bodies (and teeth!). 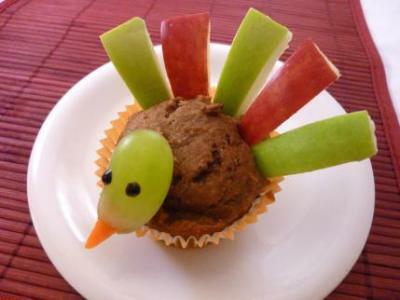 Here are a few of our favorite Thanksgiving-themed snacks that are simple and delicious! 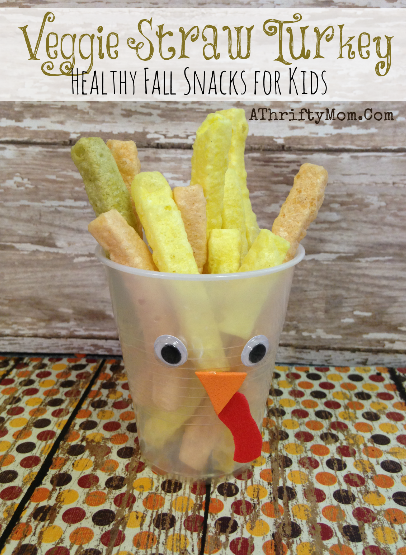 We love this healthy recipe from A Thrifty Mom because it combines food and crafting! Kids will love helping out with this one. The best part? There’s no sugar! Bonus: it’s a great snack to bring to a classroom party. To begin assembling the face of your turkey, add glue to the googly eyes and press them to the front of the cup. For the turkey’s beak, cut a small triangle out of the orange paper or foam and place it under the googly eyes. Now for the turkey’s gobbler! Snip a gobbler out of the red paper or foam and glue it under the beak. Colorful veggie straws make for perfect feathers! Simply place the veggies in the cup and flare them out to make bright, beautiful feathers for your turkey. This recipe from Your Modern Family has got it all — protein, fruit, veggies and fiber! If your kids don’t like tuna, you can easily substitute chicken salad or even peanut butter. If you go the peanut butter route, Your Modern Family says to use pretzel sticks as the feathers, grapes for the eyes, and a tiny slice of cheese for the turkey’s beak. It’s not quite as nutritious and good for teeth as tuna/chicken salad option, but it’s still a fun treat with some healthy ingredients. Cut the crust off of the first two pieces of bread. Slice your red and yellow peppers into long, thin strips, and then cut those strips in half. 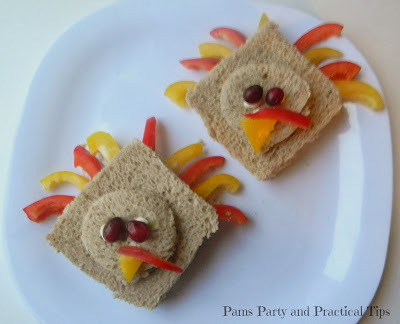 Spread tuna salad on the bottom piece of bread and arrange the peppers to make the turkey’s feathers. Add the top piece of bread. Spread tuna on the “head” of the turkey and place it on top of the sandwich. Use cream cheese to secure small cranberries to the bread for the turkey’s eyes. Cut a small triangle out of a yellow pepper for the turkey’s beak and attach with cream cheese. Cut a thin slice of red pepper for the turkey’s gobbler and attach with cream cheese. This recipe from the food and recipe section of Parenting combines apples, grapes and pumpkin muffins for a sweet treat! Cut a slice from the side of each apple. From there, cut the feathers, tapered and squared off. Cut a small beak from a thin slice of carrot. Make a slit in the end of a green grape and insert beak into grape. Poke small ends of feathers into muffin and place grape on muffin, resting on the muffin paper. Once assembled, use icing to make tiny eyes on the grape. We hope you and your kids have fun creating these healthy and yummy recipes together. Be sure to share with us next time you’re in the office what Thanksgiving snacks are big hits in your home!